Rising rap great and recent Madlib collaborator Freddie Gibbs has a lot to boast about. Among his various musical accomplishments, he apparently just got a bunch of weed through airport security and bragged about it on his Twitter. 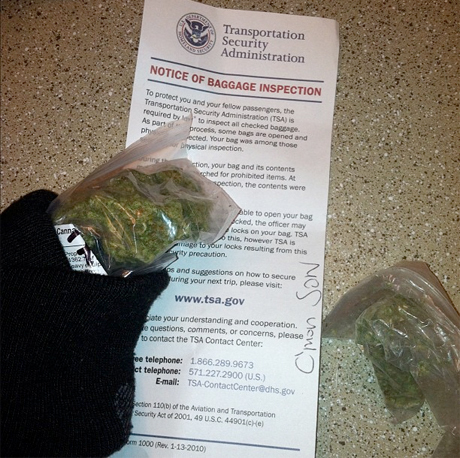 As Pitchfork points out, Gibbs tweeted, "The TSA found my weed and let me keep it. They just left me a note. 'C'mon Son'. Lol." Gibbs also supplied the above photo, just to further rub in his drug-carrying success. The New York Daily News is now reporting that the Transportation Security Administration is pissed about this claim. "TSA takes all allegations of inappropriate conduct seriously and is investigating this claim," a spokeswoman said. "Should the claims be substantiated, TSA will take appropriate disciplinary steps and refer the alleged possession of an illegal substance to law enforcement." Maybe we're biased because we love Freddie Gibbs, but a stern "C'mon Son" seems like punishment enough.